In many parts of the country, winter can be a brutal season with slippery roads and plummeting temperatures. Long gone are the sunny days where cruising your motorcycle is an enjoyable way to relax. Proper motorcycle winter storage is an important part of every gearhead’s fall ritual. Following these few simple steps will ensure that your bike starts right up next year as well and looks and performs the way you remember it. When putting your bike away for the season, it’s important to find winter storage that is dry and protected from environmental elements. Avoid storing it near windows to prevent the paint from fading with constant contact with light. The motorcycle should also be covered with a cover to prevent moisture from coming in contact with the metal and forming rust. Avoid using plastic, which can hold moisture and allow it to come in contact with the bike. That perfect exhaust note is the goal of many bike owners. When you get that perfect set of pipes on your bike the last thing you want is to have some rodents take up residence in it over the winter. Plug your exhaust pipes with a piece of steel wool when you store your motorcycle for winter; it will keep unwanted critters out. Today’s Ethanol blended fuels can start to go bad in as little as 30 days. While many people drain the fuel tank for the winter, that step is unnecessary with the use of a fuel stabilizer, such as STA-BIL® Fuel Stabilizer which keeps fuel fresh for up to 24 months. It is best to ride your bike to the gas station, add STA-BIL Fuel Stabilizer to the tank, fill with fresh gasoline and ride it home. By that point, you will have thoroughly circulated the mixture throughout the system to protect it for the season. You should change your oil right before putting your bike away. Use high-quality oil in the viscosity recommended by the manufacturer. Over the riding month’s dirt and acids build up in your oil. You do not want hose sitting in your engine over the long winter slumber. Most of us take pride in how shiny our bike is year round. This is especially important when it comes to storing your bike. A thorough cleaning and a coat of wax on all the paint and chrome is a great idea. It will minimize any oxidation that can happen and keep it protected from corrosion over the winter. Once you begin to winterize your motorcycle, make it a point to keep the battery charged by keeping it hooked up to a battery maintainer that will automatically shut off to prevent overcharging. This will prevent the battery from self-discharging and will properly care for the cells. A properly winterized bike will stay looking and perform like new for years to come. 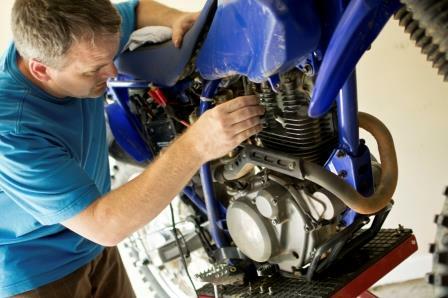 A little bit of upfront work to preserve all aspects of your bike will lower your overall costs long term as well as avoiding the headaches associated with potentially expensive bike repairs.